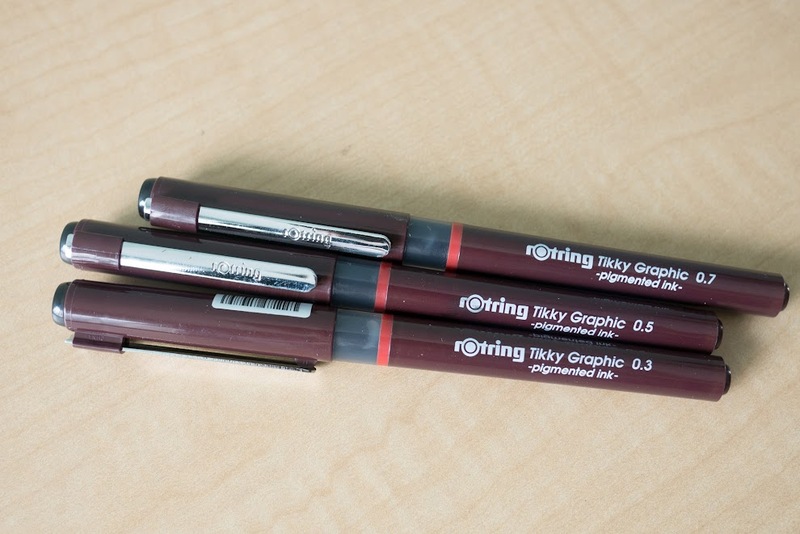 This is the Rotring set of Tikky technical pens and mechanical pencil that I bought recently. 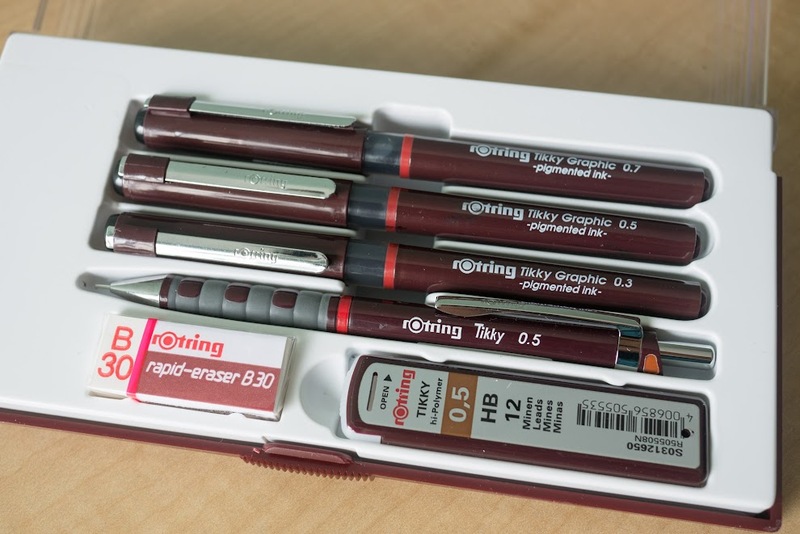 This set comes with three fineliners at 0.3, 0.5 and 0.7 plus a 0.5 mechanical pencil and an eraser. 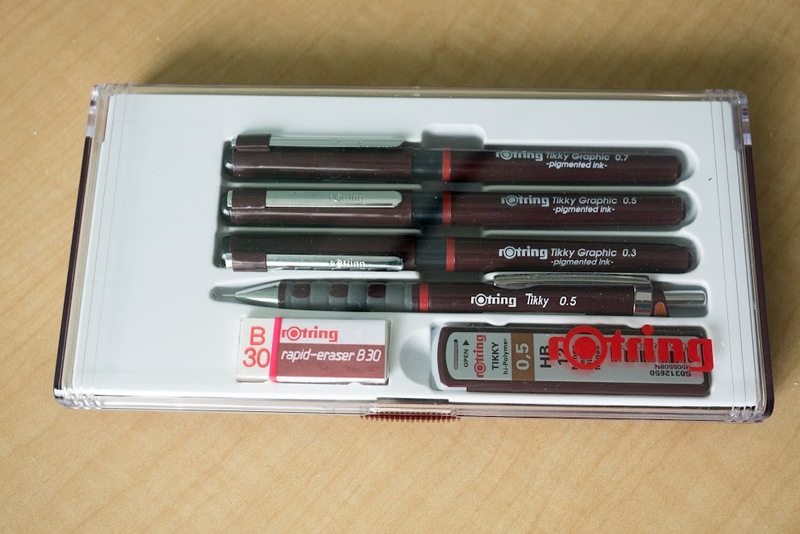 Besides the tip sizes in the box, Rotring also makes them available separately at sizes from 0.2 to 0.8mm. 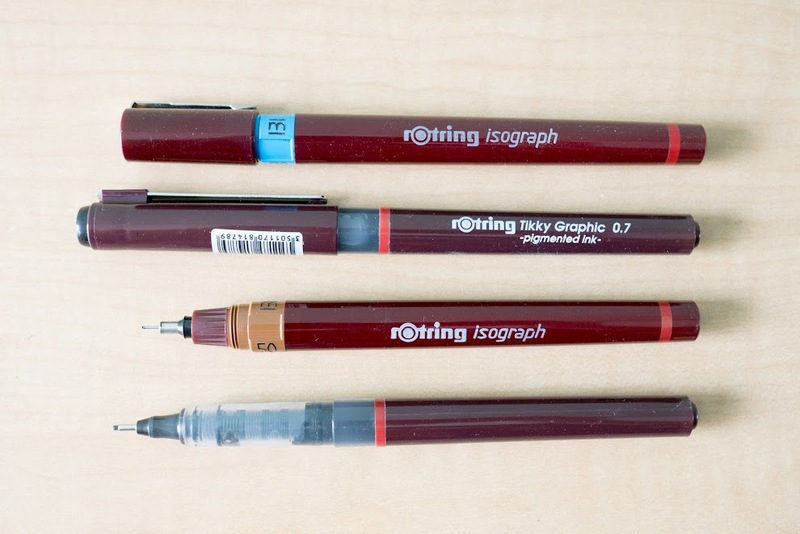 The colours of the pen bodies similar Isographs, so they look like they are from the same family of pens. 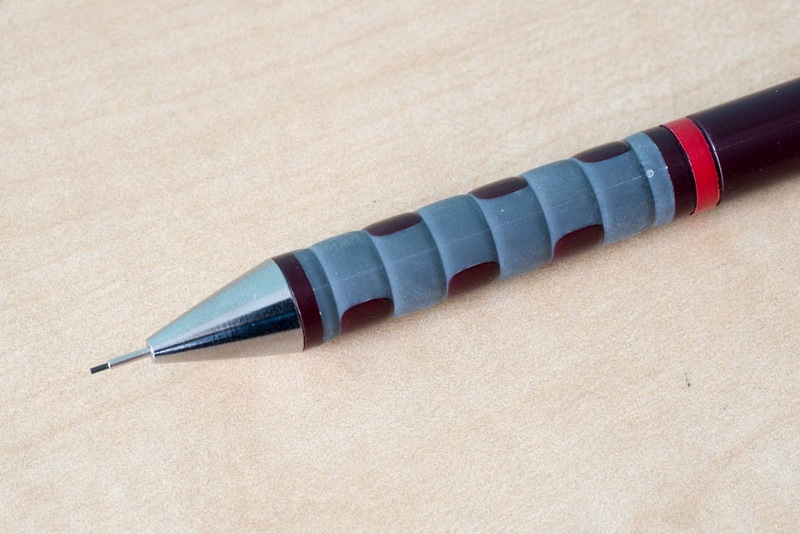 The pen uses non-fading water-proof liquid pigment ink. Near the red ring is a transparent portion for you to see the ink remaining inside. The tip is fibre or felt. It certainly is smoother on the paper compared to the metal tips from the Isographs or older Rapidographs. 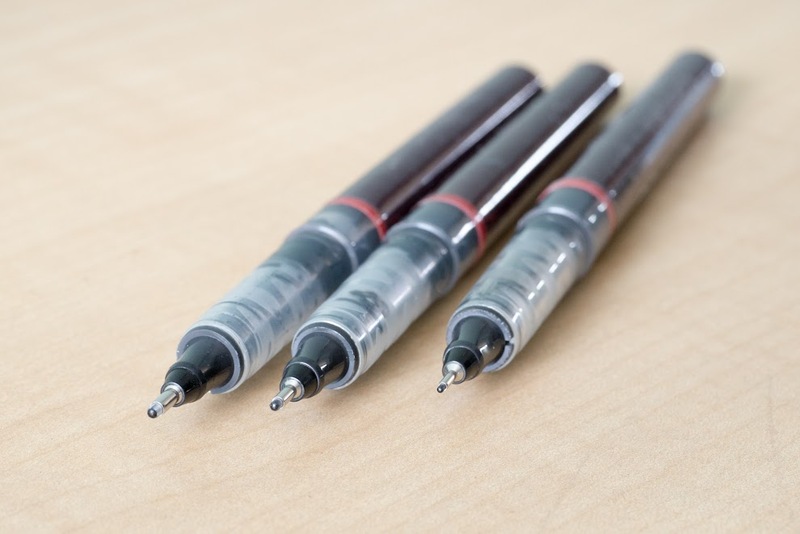 This is one good reason to choose this over the refillable technical pens. 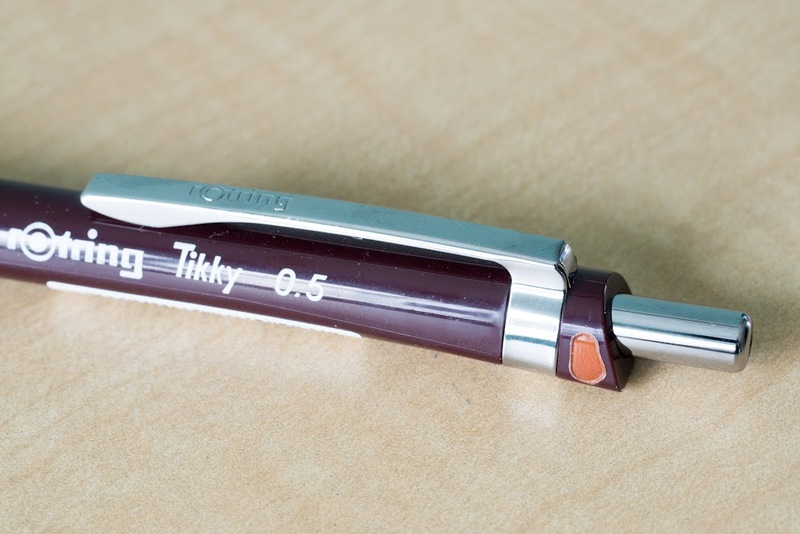 One disadvantage is the fibre tip is not going to last as long as metal, but the Tikky fineliners are meant to be disposable so the ink will be used up before the tip gets worn out. It will be wise to have several as backup since they are not refillable. However, you'll know when they are going to be used up because you can see how much ink is left. The pen feels great to hold. It's light and nimble. Technical pens are good for precise, fine sketching and accurate drawings. 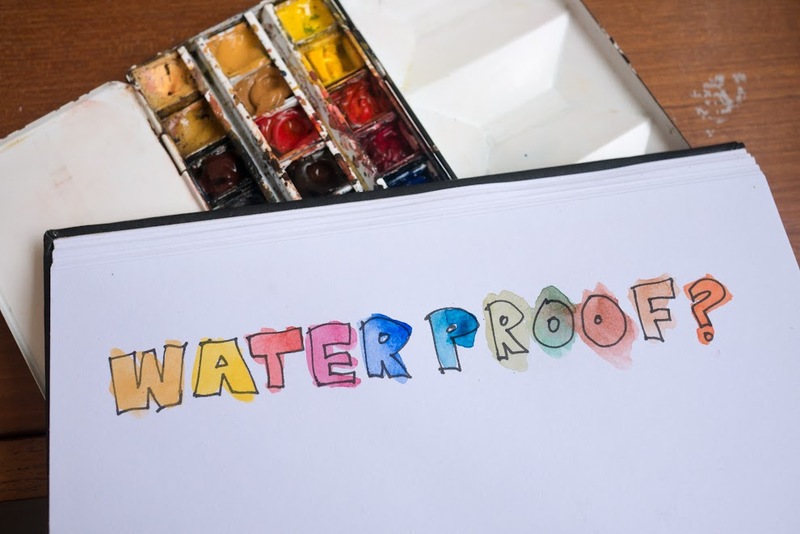 Ink comes out uniformly and dries quickly making it suitable for use with other media, such as watercolour or markers. 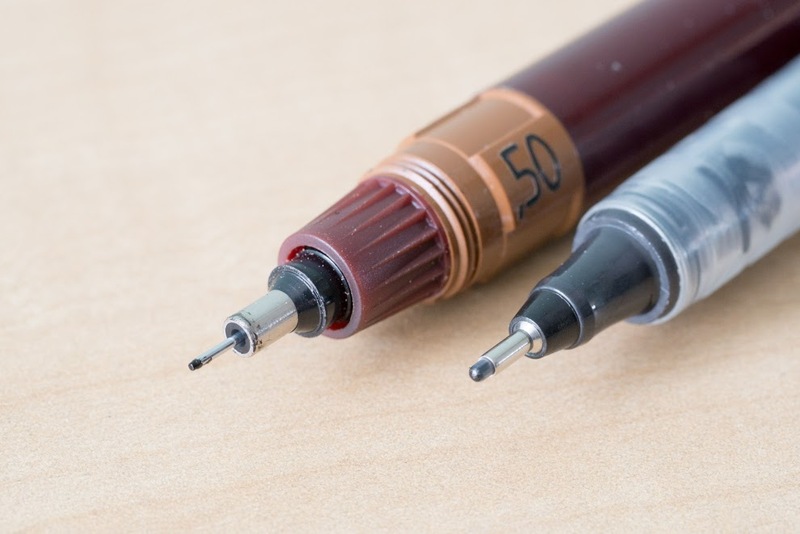 As this pen uses liquid ink, on some paper, if you leave the tip on the paper surface for too long, it may create a blob. 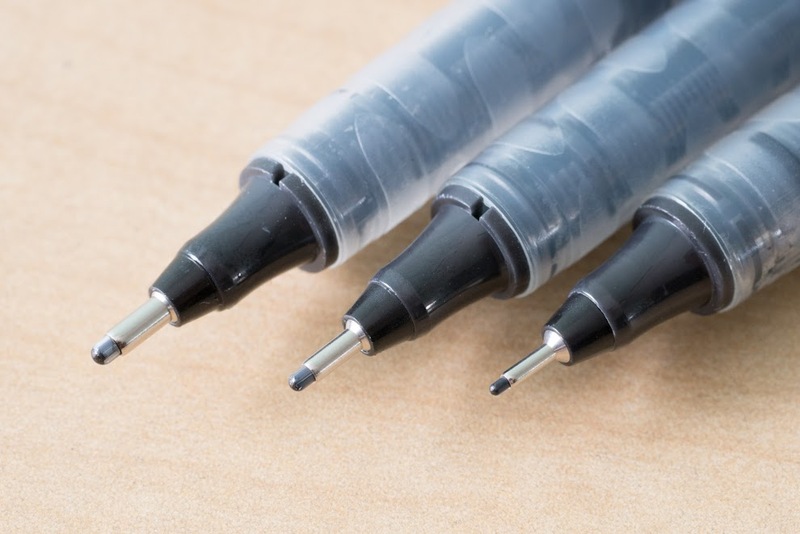 When compared to other multiliners with sponge-cartridge, those multiliners have a more controlled ink flow and would not behave like this. The mechanical pencil works well too. It's has a firm spring and sharp tip. 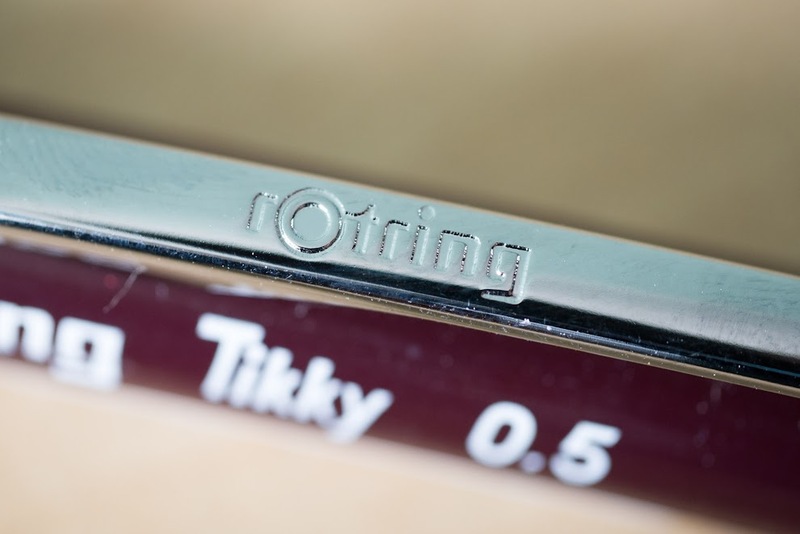 The grip uses rubber and the design motif is similar to that on the grip of the Tikky fineliner. The mechanical pencils are also available with different tip sizes at 0.35, 0.5 and 0.7mm. The set comes with 0.5mm 12 HB leads. 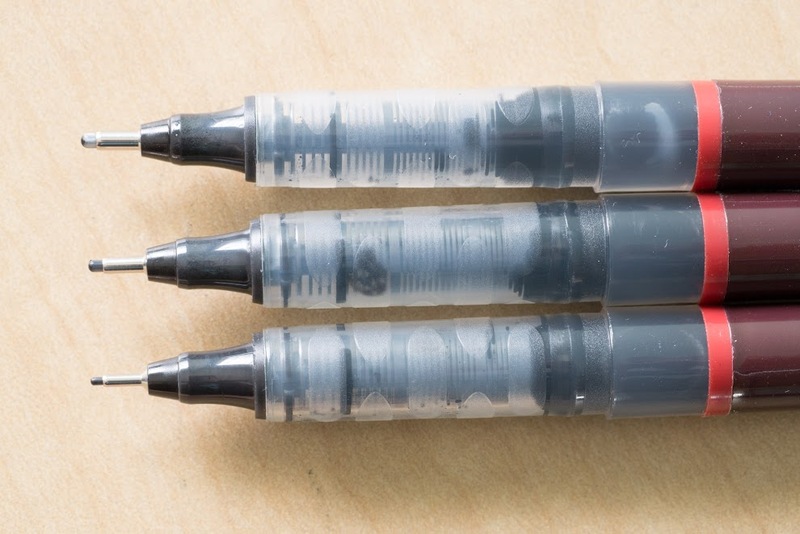 For disposable fineliners, I prefer using these over the Copic Multiliners. I like the design more, the idea of liquid ink and you can also check the ink level. 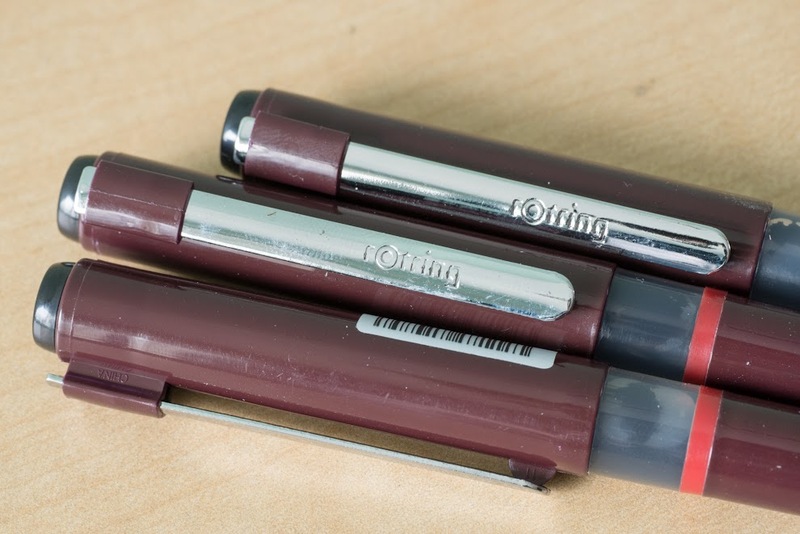 It's much cheaper to buy the set than to get the pens separately. I'll probably replace my fineliners when they are used by buying the set, it's more economical but also means I'll end up with extra pencils.